It's always hard for me to accept that Iceland has no Runestones. None. Not any. However, it does bring me some solace to know that the tiny Faroe Islands, with a population of just over 50,000, has three of them - the Sandavágur Stone (discovered 1917), the Kirkjubøur Stone (discovered 1832), and the Fámjin Stone (discovery date unclear). Although they were all originally housed in churches with the same name as the stones, at least one reference said that they are all housed in the Faroese National Museum in Tórshavn, though I think that may be the case only for the Kirkjubøur Stone. What is most interesting to me about these stones is the age range among them. The Kirkjubøur Stone is the oldest, dating from the Viking Age (between the 8th and 11th centuries). The Sandavágur Stone is next from the 13th century, while the Fámjin Stone is about 300 years younger dated to the middle/end of the 16th century. That demonstrates Rune usage well into the Middle Ages. The Fámjin Stone has Roman letters on it in addition to the Runes, but given how young it is, that is not so surprising. Still, I couldn't find what was carved on the stone. The oldest of the stones, the Kirkjubøur Stone, says something about peace being granted to someone named Vígulf. Although I couldn't find a picture of the stone itself, the Runic carving appears on a stamp. It's in the background and and image of the Sandavágur Stone is in the front. 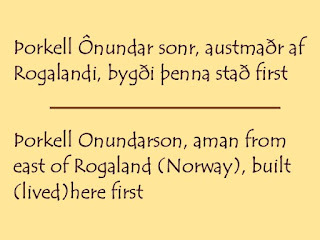 The Sandavágur Stone also has the most complete inscription. 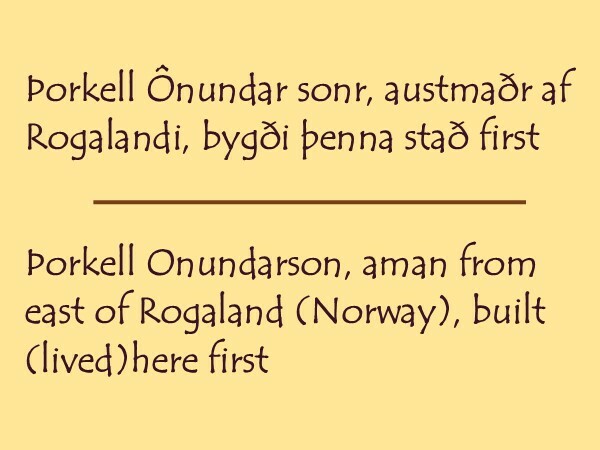 It refers to Thorkell Onundarson,claiming that he was the first to build there. The impression seems to be that he was the first permanent settler at least in the Sandavágur area. Researching these stones left me convinced that I need to put the Faroe Islands on my list of places to visit so that I can see them for myself and share more about them. If you've been there and have pictures, you're willing to share, please let me know.